Bangladesh has approved a plan to temporarily house 100,000 Rohingya Muslims fleeing violence in neighboring Myanmar. The plan would put the refugees on Bhashan Char, an island in the Bay of Bengal that floods frequently. Bangladesh’s government approved the plan on Tuesday to develop the island, despite criticism from humanitarian workers. They have said the island is nearly uninhabitable. The decision came days after Bangladesh completed talks to start returning the Rohingya refugees to Myanmar. Planning Minister Mustafa Kamal said it would take time to return the refugees. In the meantime, Bangladesh needs a place to house them. The project to house refugees on the island would be complete by 2019, he said. A plan to develop the island and use it to house refugees was first proposed in 2015. The island regularly floods between the months of June and September. That is monsoon season for the area. It is two hours by boat from the nearest settlement. When the sea is calm, pirates sail around nearby waters and kidnap fishermen for ransom. More than 620,000 Rohingya Muslims have fled to Bangladesh since the military in mostly Buddhist Myanmar launched a severe counter-insurgency operation against them. The operation across Rakhine state followed attacks by Rohingya militants on an army base and police posts. 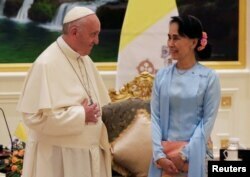 Meanwhile, Pope Francis said the future of Myanmar depends on respecting the rights of each ethnic group. But he did not use the word “Rohingya” in his speech to civilian leaders of the country. Myanmar’s Catholic Church has asked the Pope to avoid saying “Rohingya,” because doing so could lead to strong reaction against the small Catholic community in the Buddhist-majority country. Myanmar does not recognize the Rohingya as citizens. The Pope plans to visit Bangladesh on Thursday. His visit does not include a visit to a refugee camp. But he is expected to meet with a small group of Rohingya in Dhaka, the capital of Bangladesh.